I recently had the opportunity to attend an economic development event in Downtown Riverside that highlighted all the hotel, residential and retail activity happening in the area. For me, the high point of the get together was visiting the Riverside Food Lab, the Inland Empire’s first food hall as well as spending some time with its developer, Jerry Tessier of Arteco Partners. I am a big fan of Jerry’s work. I think he is one of the most talented developers I have ever met. He has a gift for taking old structures and making them come alive again. Everything he and his family has done has been untraditional. His family has been actively involved in the redevelopment of Downtown Pomona for well over 20 years helping to turn what was once a very down trodden area into a vibrant arts, education and restaurant scene. Jerry and his family also renovated the Claremont Packing House, a structure that had been closed for many years and turned it into one of the anchors of what is known as Claremont’s Village West. The Packing House includes a very successful Eureka Restaurant, Flappers Comedy Club, Gus’s BBQ, The Whisper House and other retail and restaurant experiences as well as 16 live/work lofts. The creation of the Riverside Food Lab was different. It did not involve renovating an historic building. Instead it required taking a portion of the first floor of a city owned parking structure that had sat vacant since the economic downturn and transforming it into a vibrant food hall. 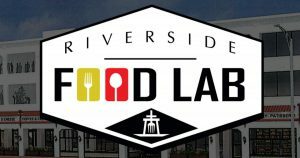 The Riverside Food Lab is located next to the Fox Performing Arts Center at 3605 Market Street just a couple of blocks from the historic Mission Inn. It’s open daily from 11am to 11pm and is comprised of 14 unique eateries offering a wide range of food choices. The list includes Beer Farm, Bricks and Birch, Dia De Los Puercos, Masala Mischief, Monty’s Good Burger, and Pig Pen. It is bright with great interior signage and plenty of comfortable seating. Jerry shared with me the challenges of creating such a unique venue in which they were responsible for the entire infrastructure including all the plumbing, hoods, and seating areas. In order to realize the vision for the project he and a full-time employee spent over a year visiting farmer’s markets, food truck events, and independent restaurants to explain the concept and secure the operators. 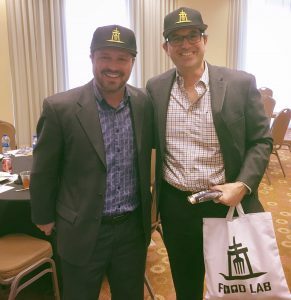 In addition to all these efforts, Jerry and his team work closely with the restaurants and surrounding businesses to promote the Food Lab and all of the activities in downtown Riverside. This includes a significant amount of effort working the social media scene to drive local residents and the over 30,000 students in the immediate trade area to the Riverside Food Lab. Jerry’s other works in progress include the Redlands Packing Plant food hall in Redlands which entails the renovation of a building constructed in 1912 and the addition of a food hall at Vail Headquarters in Temecula which also involves a historic renovation into specialty restaurants and boutiques. I look forward to visiting both once they’re completed. In the meantime, I’m looking forward to experiencing the Riverside Food Lab again very soon. It’s truly a great addition to Downtown Riverside and I congratulate Jerry and the Arteco Partners team on a project well done!